As Next Level Performance co-founder in 2007, My vision was to bring a whole new style of training to Staten Island that would be cutting edge, exciting and fun. I have been training now for over 12 years and have motivated many to change their health lifestyles. As a athlete, runner and dedicated trainer, I personally have lost over 80 lbs and have inspired others to do the same. ” My passion is motivating people to change like I did and enter a new world of health, fitness, and wellness – and to stay there.” My love of training has motivated me to seek cutting edge certifications such as a Underground Strength Coach, RKC Kettlebell, Training for Warriors and Art of Strength instructor. I have also completed certifications in battle ropes, sandbags and various strength and conditioning programs. My favorite three words – Why Not Now! Donald Girard – CrossFit Olympic Lifting Coach, AOS Kettlebell Instructor, ACE-CPT, CPR/AED /First Aid National Green Cross certification. Donald is the combination of smart, skilled, and dedicated. He brings over 15 years of training experience to the NLP training center. He has an encyclopedic knowledge of body mechanics and as a result can train for maximum results, without risking injury. 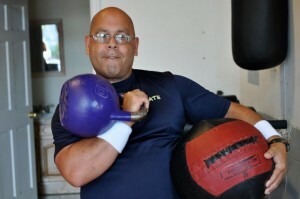 As a versatile trainer Donald earned his reputation as a Head Trainer while working for the Staten Island South Shore YMCA. Donald trains his clients as they are intended to move, naturally through functionally integrated movements not isolated muscle groups. Donald’s vision is to create an environment that will provide people with a combination of perspiration, motivation and inspiration which will prepare his clients for the challenges that life places in their paths and becoming the best they can be. Donald combines his expertise as a functional trainer, Strength & Conditioning coach, and Kettlebell Instructor as well as a speed, agility, and quickness specialist, paired with his cutting edge approach to fitness, which makes for a demanding yet rewarding training experience. His passion is to see that his client’s succeed in attaining their fitness goals.